The Natural Orange Tree shows a portiere tapestry featuring the orange tree. The orange tree were cultivated in China in 2500 BC and were introduced to the Mediterranean area in the 16th century by Italian and Portuguese explorers. The orange is a symbol of love and marriage in many cultures. Renaissance paintings featured them in works depicting married couples. Here we see a orange tree in full bloom with orange flowers as well as fruit. 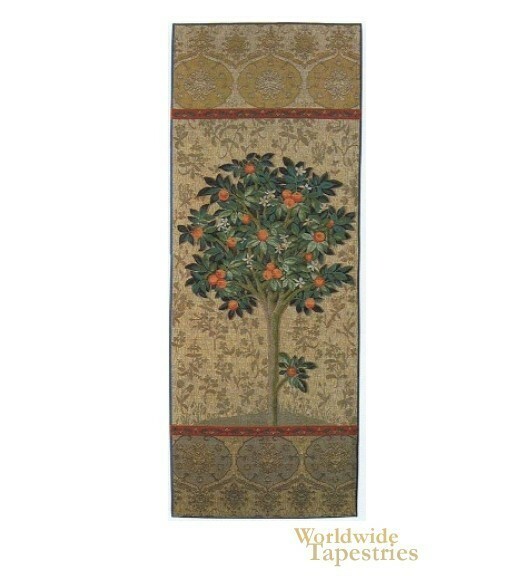 This Natural Orange tapestry is backed with lining and tunnel for easy hanging.